The I.P.O. pipeline in the United States is filling up as companies once afraid of braving the capital markets are now lining up to for initial public offerings. A fair number of these companies, especially in the financial industry, are looking to spin off businesses at lucrative prices. Frenzied bargain hunters who descended on the Tavern on the Green tag sale on Friday hardly entertained hopes of landing the $180,000 leaded-glass ceiling, as it was long gone. And they knew the $75,000 stained-glass peacock was but a memory. No, the hundreds of memento seekers swarming the bankrupt restaurant in Central Park knew that all the really pricey stuff had been gaveled away in mid-January, during the $3.5 million, three-day auction of about 25,000 items. Cameron Lester and Mike Kwatinetz of Azure Capital Partners examine why start-up companies need to be time-efficient as well as capital-efficient. In the world of start-ups, capital efficiency is a factor in determining how much entrepreneurs and investors realize on their invested time and capital. It is the ability of a business to reach positive cash flow at scale while consuming an acceptable amount of invested capital. It is important to limit shareholder dilution to entrepreneurs and early investors — the more capital raised, generally the less of the business the entrepreneur and the early venture capitalists will own. 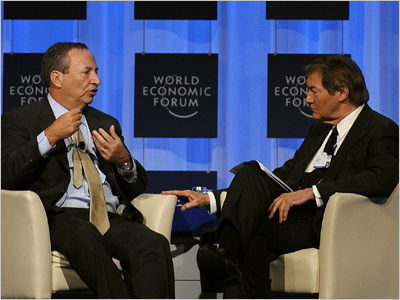 Agence France Presse Lawrence H. Summers, left, with Charlie Rose at the World Economic Forum. Mr. Summers maintained the pressure on banks to accept greater regulation. The Obama administration finally weighed in on Friday at the World Economic Forum, as Lawrence H. Summers, director of the National Economic Council, criticized banks that are resisting regulation even as they dispense lucrative bonuses to their executives. Mr. Summers criticized financial institutions that are opposing a proposal by President Obama to tax bank liabilities and use the money to insure against future crises. The banks insist that paying big bonuses has no effect on their ability to lend, but the tax would, Mr. Summers told a Davos audience. Sheila Bair, the head of the Federal Deposit Insurance Corporation, said on Friday that proposed proprietary trading limits are “very positive,” but said they would not have necessarily reined in risk-taking at the institutions that required huge bailouts. President Obama last week proposed banning financial institutions with commercial banking operations from engaging in proprietary trading operations that are for their own profit, not for their clients’. BlackRock said Friday that it had hired a former Goldman Sachs banker, Kendrick R. Wilson, to be a vice chairman and help support the firm’s client relations as the firm solidifies its position as one of the world’s largest asset managers. Mr. Wilson’s large Rolodex could help BlackRock’s win new clients as well as help it gain a louder voice in Washington. We can’t stress this enough: Washington is the dominant topic at the World Economic Forum in Davos, Switzerland this year. Between the panels and at the parties, political and business leaders from around the world keep asking whether or not the Obama administration can pull off its ambitious initiatives. Davos Diary’s Andrew Ross Sorkin spoke on Friday with CNBC’s Becky Quick and Time International’s Michael Elliott about Washington’s attempts at financial regulatory reform. The three weighed in on the populist atmosphere in the United States, and whether that would inhibit the Obama administration as it seeks an overhaul of how banks are overseen. The financial markets are returning to measurable health and consequently private equity firms are now doing deals more frequently, even those particularly hurt. Apollo Management, scarred by the Huntsman/Hexion acquisition, has a pending acquisition of Cedar Fair, and TPG, which posted a $1.35 billion loss after its investment in Washington Mutual, is acquiring IMS Health. About a week ago, Lone Star Funds agreed to acquire Lodgian in a deal valued at $270 million. Even with the lower celebrity wattage of this year’s World Economic Forum, there are still important political and business leaders wandering around the ski resort that is Davos, Switzerland this week. 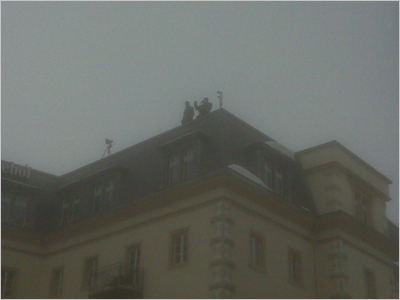 And protecting them requires tight security, as the snipers shown here demonstrate. That’s beyond the tight cordon around the part of town where the Forum’s main panels are held. (Unlike in years past, laptop computer are no longer allowed in the main part of the gathering, and Davos security has cracked down on vehicle permits. Bain Capital said Friday that it has invested $12 million in Edgar Online, a publicly traded data services company that helps businesses prepare regulatory filings in a new format that will be mandatory by 2012. Another View: The Revenge of the Luddites? Michael Pagano, a finance professor at Villanova, argues that the Volcker Rule resembles another attempt to turn back progress — namely, the Luddite movement of nearly 200 years ago. Like many of us, I have looked on in disbelief and dismay as the financial crisis and nascent recovery unfolded over the last two and a half years. Given the severity of this crisis and the excesses that caused it, I am open to hearing prudent ways we can do things differently that can help us avoid a repeat of the recent financial and economic turmoil. The annual lunch hosted by Ukrainian powerbroker and philanthropist Viktor Pinchuk in Davos has often been a bellwether for the tangled politics of the huge country of 46 million sandwiched between Russia and Europe. Friday’s was no exception given that the second round of presidential elections falls on Feb. 7. Mr. Pinchuk opened the proceedings with a spoof movie on the Brangelina hit ”Mr. and Mrs. Smith” — where Brad Pitt and Angelina Jolie first fell in love — entitled ”Mr. and Mrs. Y,” referring to the two contenders, Viktor F. Yanukovich and Yulia Tymoshenko. Good morning from Davos, where the topic of the day isn’t anything that happened during the official panels of the World Economic Forum. Instead, it’s a closed-door gathering of top bank executives, who are trying to plan a response to the growing call from governments for tougher financial services regulation. Steven D. Black, the executive chairman of JPMorgan Chase’s investment bank, was named a vice chairman of the firm on Thursday, as part of a plan to give more responsibility to the investment banking head, James E. Staley. After The Wall Street Journal reported that banks were doling out other financial perks to their employees to ease the toll taken by the slimmer bonuses, Gawker got busy investigating Goldman Sachs’s lending practices. Where's the Global Finance Sheriff? The Financial Crisis Inquiry Commission wants your questions to ask the nation’s big bank chiefs. We’re happy to collect your questions and give them to the panel. Submit your questions here, and we’ll pass them along to the commission. A blog-within-a-blog that looks at mergers, private equity and corporate governance through a legal lens, written by Steven M. Davidoff, a professor at the University of Connecticut School of Law and a former lawyer at Shearman & Sterling. DealBook’s look at the hopeful signs and lingering concerns as Wall Street gets back to work a year after the crisis. The latest hires, promotions and departures at investment banks, law firms and private equity and hedge funds. Got a Tip for DealBook? Where’s the Plan, Wall Street? Private and Corporate Offshore Bank Accounts Worldwide. Setting Up a Hedge Fund? Visit mobile.nytimes.com/bbinstall directly from your BlackBerry or by text “db install” to 698698. Continuously updated headlines from DealBook, right in your blog, social network or search engine home page. We’ve been twittering for more than a year. Andrew Ross Sorkin’s commentary on deals and the deal makers behind them.